Can you confirm these amateur observations of Cyrtodactylus wayakonei? Type locality: Kao Rao Cave, near Ban Nam Eng, Vieng Phoukha District, Luang Nam Tha Province, northern Laos (20°43.516’N, 101°09.239’E), elevation 730 m.
Types Holotype: IEBR A.2010.01, adult male, collected on 1 May 2010 by Truong Quang Nguyen and Phouthone Kingsada. Paratypes. ZFMK 91016, adult male; MTD 47731, NUOL 2010.1, adult females; the same locality as the holotype, altitude 730–810 m a.s.l., collected between 1 and 2 May 2010 by Truong Quang Nguyen and Phouthone Kingsada (Figs. 4–5). Diagnosis Diagnosis. A medium sized Cyrtodactylus of up to 90 mm maximum SVL, head distinct from slender body, with flat belly. Cyrtodactylus wayakonei sp. n. can be distinguished from all congeners on the basis of the following combination of characters: 7–8 supralabials; 9–10 infralabials; rostrum bearing smooth scales; 34–45 scales between fifth supralabials; dorsal tubercles smooth to slightly keeled; 17–19 rows of dorsal tubercles; ventrolateral folds slightly developed, with large tubercles; 31–35 ventrals; 85–98 scales around midbody; 151–163 scales between mental and cloacal slit; 6–8 precloacal pores in both sexes; precloacal groove lacking; femoral scales not enlarged; no femoral pores; subcaudals somewhat enlarged, broadened; tail tubercles flat, smooth; head and dorsum with blotched to reticulated pattern. 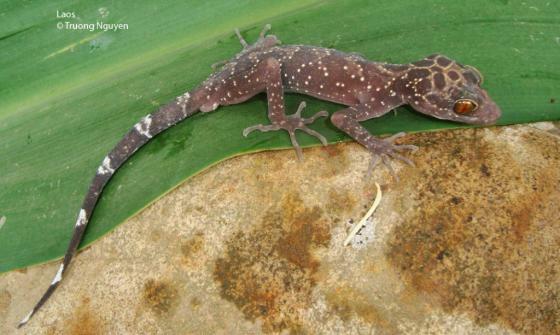 Etymology The new Cyrtodactylus species is named after Associate Professor Dr. Sengdeuane Wayakone, Director, Office of Planning and International Cooperation, National University of Laos, in recognition of his efforts to investigate and protect biodiversity in Laos.